Consumer perceptions and drivers of liking are changing. In order to stay on top of your business you need to constantly understand the consumer market, what they want and how to develop products that meet their needs. Understanding the voice of the consumer and being ahead of the competition are the keys behind each successful product. At SRL, as a consumer research company, we provide our clients with both central location and home use tests. Central location tests allow manufacturers to understand how their products are liked, or how they perform against their competitor throughout the world. At SRL we can perform Central Location Tests in most major cities in the world. Certain projects require assessing the products under real conditions of use. Knowing how your product performs in real life will provide information about repeated use or purchase of your product without the controlled environment of a central location test. Online Surveys are using web-based questionnaires and they allow fast access to large number of participants through the world. Focus Groups provide great qualitative feedback about products or new concepts prior to commercialization. 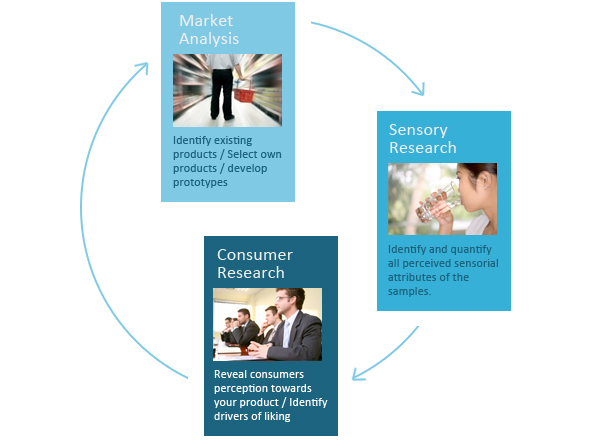 Their interactive nature help identify key product characteristics and provide insights to consumers perception. Focus groups also provide valuable information on how consumers perceive a product compared to competitors, providing insights into how a product may be improved to strengthen or reach market leadership. At SRL we offer a full range of focus group services including customized focus groups specifically selected to match your needs. Conjoint Analysis is an advanced market research method that reveals how people make decisions and what they really prefer in products and services. It is based on the fact that each entity (product, service or even concept) consists of different options and features. Rather than analyzing each feature independently, conjoint analysis investigates the interactions of the different features and it provides optimal combinations of design options and features to satisfy the end users. Conjoint analysis is the ideal method for answering questions such as “What price can I ask for my product?” or “Which is the best combination of the design factors?” It is a cost-effective and time efficient method to design new products, re-position existing ones and make profitable pricing decisions. Quality Function Deployment (QFD) is a consumer-oriented method that bridges consumer demands and value with the product and production characteristics established by the product developers. QFD provides a systematic view of the links between the market needs and the product developer capabilities. It provides information for all stages of the product development or improvement cycle, from concept to commercialization and market performance. With a QFD system you will be able to link the “voice of the consumer” with the “voice of the company” and ensure that product developers can apply a cost-effective consumer-oriented approach to product development and improvement. In order to understand how your product performs and what your consumers think about it, you will need to know your market, understand your products and understand your consumers. Optimize your recipe to meet consumer expectations. Our mission is to deliver the products you need when and where you need them. SRL’s product procurement service can help you retrieve your own or competitor products in the most timely and cost efficient manner. Sean O Sullivan, LEO. Oonagh Connolly, AIB. Margaret Shine, SRL. Paul Healy, Rubicon attending the Economic Market Outlook September24th. at the Clayton Hotel Cork.